Today, when you order "Black Water Clear Water Double Pack", you'll instantly be emailed a Penguin Magic gift certificate. You can spend it on anything you like at Penguin, just like cash. Just complete your order as normal, and within seconds you'll get an email with your gift certificate. 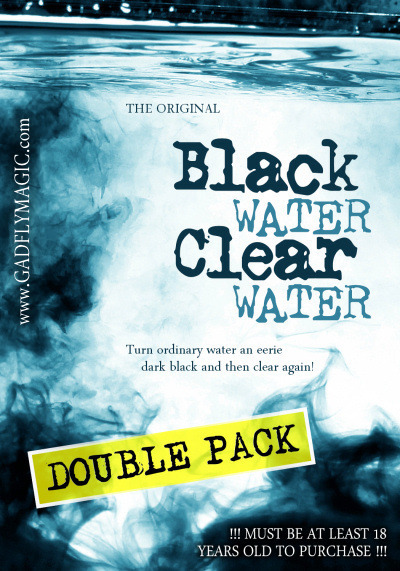 Get TWO FULL SIZE packs of Black Water Clear Water for ONE LOW COMBO PRICE: this is the Black Water Clear Water DOUBLE PACK! The Black Water Clear Water DOUBLE PACK includes enough chemical to turn about 40 gallons of water black and then clear again, depending on the particles already in the water (purity). Black Water Clear Water adds impact to just about any trick using water! The best trick with Black Water Clear Water is Sands of the Desert! (sold separately) Three colored sands are poured into water and mixed up. One by one, they are removed separated by color. After each color is pulled from its watery grave, it's shown instantly dry!